Bollywood rules our lives: it entertains us, gives us dreams, fills us with longing makes us laugh. It is glorious and it is absurd. The Greatest Show on Earth celebrates all that is fascinating about Hindi cinema. Writers and industry insiders like Saadat Hasan Manto, Salman Rushdie, Bhisham Sahni, R.K. Narayan, Ismat Chughtai, Suketu Mehta, Shobhaa De, Dev Anand, Dada Kondke and Manna Dey write about superstars and strugglers, filmmakers and playback singers, on-screen kisses and off-screen romance, the casting couch and censorship. Compiled and edited by one of India's most perceptive and entertaining commentators on the Hindi film industry, this eclectic, wide-ranging anthology will inform and delight everyone with an interest in Indian cinema and popular culture. Jerry Pinto is a writer, Poet and journalist based in Mumbai. His published books include Helen: The Life and Times of a Bollywood H-Bomb. Which won the national Award for the best Book on Cinema? 'No ... No ... ' she curtly came up. 'I can't say anything over that. And it's for you to understand the matters. Certain things could not be detailed and this is one among them. 'Certainly I don't think so! Even without hearing or knowing my statement he could know things. He is no more a kid. He is a broadminded man with a very considerate outlook and capable of knowing the legitimate demands of my profession. I'm very lucky and glad to have got him as my husband,' she giggled. 'How can I say that? All parts of my body. I can say only that,' she looked at her body for a while. And according to your husband?' I continued digging. He loves every inch of me. But he always takes high of my hurdles. I think he's fetishist of Bottom,' she said with a wicked gleam in her eyes. At this time one of my friends poured cold water on my face and it woke me up from my sleep. What a lovely dream and interview it was. For a true fan of the movies.' watching them is never enough. Reading about that other universe and its stars is part of the syndrome. The above-mentioned Film Mirror was only one of the many film magazines I read when I was growing up, and I read It sitting In the barber's shop. That was among the few places one had access to any form of writing about popular Hindi cinema back then .. The mainstream press rarely covered it, except in the weekly reviews and the occasional, anaemic interview. For news of what was really happening in Bollywood, as it was only beginning to be called, we had to turn to the film magazines that were rarely allowed into respectable middle-class homes. I read about Parveen Babi and Kabir Bedi exercising together, him in briefs and her in a bikini. I thought Devyani Chaubal often wrote more about herself than about the stars but I was still aghast when Dharmendra chased her around the Mahalaxmi Race Course when she described Hema Malini as a stale idli. I remember the tension that surrounded the Neetu Singh-Rishi Kapoor romance. Would he, wouldn't he and what would everyone in the Kapoor Khandaan, from his mother Krishna to his driver, say? And was it true that Vinod Khanna was going to leave his sons and wife and become a gardener in the Rajneesh Ashram? (It was.) If the 1970s were the glory years for film magazines, the 1980s came storming in with Movie, well-produced and glossy. In 1984, Showtime was launched; it was supposed to be the intelligent magazine for the discerning reader, though it started offering gossip in a few years and now seems to have become a magazine about television stars. I read them all. I didn't care. As long as it was about Bollywood I was hooked. From time to time, I did remember feeling that I was being taken for a ride. Janki Dass' column in Film Mirror is a good example. It was called 'Dames Down Memory Lane', and in It the veteran character actor once claimed that he had lost his chance at an Olympic medal because he had been seduced on the eve of the cycling events by a Bollywood star who had rubbed him up and down with scented unguents before having her vile way with him. Then another film magazine set up a shoot in which Vinod Khanna was mobbed by its staff, all pretending to be fans demanding autographs, so that it could claim that his popularity was overtaking Amitabh Bachchan's. I didn't bother about how timely the news was. I didn't particularly care. I could read a six-month-old magazine with a much enthusiasm as a new one This gave me the odd but exciting feeling of living in several time zones at once. (This often happens with those who love cinema in any form. You watch a film in which. Raj Kapoor is a young man. You then watch a television interview with him where he is an old man. And you know he is dead.) However, since we did not subscribe to these magazines as a family, I had to read them when I could and where I could. So while reading a Court Martial column in Stardust, I had to piece things together. From what I remembered, say, Gogo and Lulu were sworn enemies. Only in this particular Court Martial it appeared that Gogo thought Lulu had a great sense of timing and was a superb actor. Sometimes the journalist in charge of the Court Martial would remind Gogo about the problems he had with Lulu. Gogo would say that there was no problem. The Journalist would then remind Gogo about Lulu replacing him in the big banner's forthcoming film. Gogo would say that he had turned down the film because of a 'dates problem'. Then Gogo might add that It was all the media's fault, that journalists were forever adding their own 'mirch masala' and causing trouble. Bollywood, as it was presented in these magazines was a wonderful space in which nothing was as it should be. There was a sense of disconnection with the real world. In the real world, the middle class rose betimes to form queues to buy milk and worried about the availability of kerosene; out there in Juhu, the stars worried only about the availability of time. Several were doing worn three shifts a day. 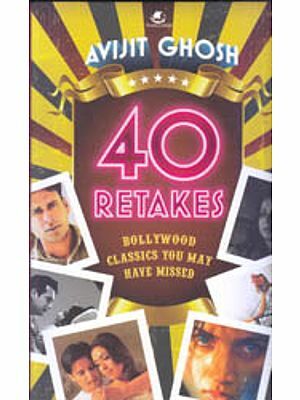 (Shashi Kapoor had, after the success of Char Machaye Shor, signed 'more than three dozen films'. He was working on them all at once.) But we did not grudge them this difference. I remember a huge article on Rekha which claimed that she had drawn elements of her style-this was before. her transformation into the Gloriana of Lip-Gloss-from such unlikely ersons as Jaya Bhaduri and Zarina Wahab. This was such brilliant nonsense that you had to read it. As you had to absorb every last detail about the Bengali Tigresses at war-Sharmila Tagore and Raakhee, for those who came in late-and the sorry mess of the Asma-Dilip Kumar-Saira Banu affair. It was because the stars led such different lives that we were so fond of them and so addicted to these magazines. I remember reading about Jeetendra sympathizing with the common man about the price of onions. He said something to the effect that it was all right for the stars but what about ordinary people? Raakhee, on the other hand, said that onions were used to sweeten curries and that there were other ways to do that. I think she suggested tomatoes but I can't be very sure. Neither remark seemed very fitting. We did not need sympathy from the stars. Nor did we need recipes even if we all knew that Raakhee often made fish curry for the entire unit, back in the days 'when shooting was like going on a picnic', and 'the industry was a different place'. What we wanted was the assurance that their world was a bright and unwholesome place. What we wanted was a validation of our morality. They were living out our fantasies and they were paying the price. They still are. We still talk of their addictions and aspirations. We still gather at the gates of their bungalows. We still consume their words with the same mixture of contempt and hunger. This is because of and despite the fact that there is very little that is new in what we read. Anyone who has read five-star interviews will recognize Bollywood's cliches. Every year, the stars say pretty much the same things. One of them says she has made mistakes but now wants to focus on her profession. Another says that he wants to do roles with shades of grey in them. A third says she is delighted to be working with the fourth. We have read this before. We will read it again. The repetition cheers us. Bollywood is as it should be.